Sparrows Group and engineering and manufacturing firm INNOVO have deployed INNOVO’s new electric drive 700 Te multi-reel drive system for the first time. 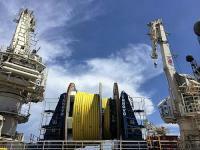 Sparrows was hired by a global energy services provider to deliver the system and personnel for an umbilical laying operation off the coast of Trinidad. The 700 Te reel drive system is the largest capacity in the rental market and the electric drive provides better control for offshore operations, in this instance allowing the umbilical to be laid directly from the system therefore reducing the deck space required. The work saw the collaborative team commission and test the 700 Te reel drive system at Sparrows’ facility in Aberdeen before the modular unit was shipped to Trinidad. 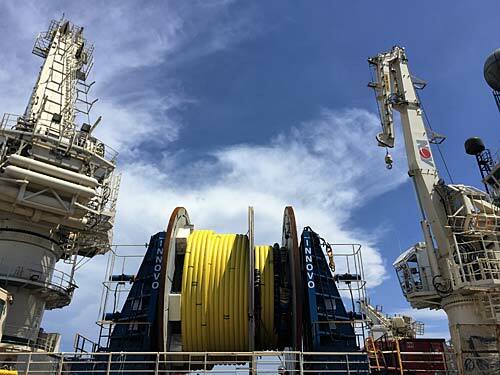 “In addition to providing the 700 Te reel drive system, Sparrows and INNOVO engineered a customised track system to allow one tower to be moved forward to facilitate swapping of the reels offshore from a barge. By working together with INNOVO, we have been able to deliver a tailored solution for our client which addressed the challenges of the work scope,” adds Morrison. The completion of the project follows the announcement last year that Sparrows Group and INNOVO would be collaborating to provide the offshore oil and gas industry with the first fully electric-drive flexible lay system for rental. INNOVO is devoted to providing high value professional services and high technology equipment for the renewables, oil and gas and marine business sectors. They are a member of DNV GL’s Joint Industry Project (JIP) aimed at developing a new set of guidelines related to the development of codes and standards for offshore equipment for cable and pipe laying.